BOOM! Studios discussed their dedication to creating original comics at their Chicago Comics & Entertainment Expo panel Friday. Onstage with him were James Tynion IV and Paul Jenkins, two creators who said they were drawn to BOOM! because of the creative freedom the publisher afforded them. An example Tynion gave was the process he went through shopping around “The Woods.” He said a lot of publishers liked the idea of the story but turned him down because the series didn’t fit into an easily definable genre. 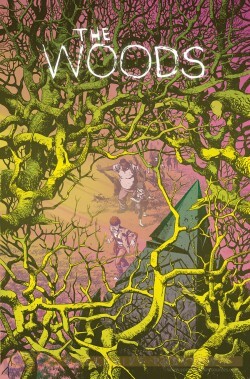 The premise for the “The Woods” is that a Midwestern American high school is mysteriously transported to a far off alien planet. The students and teachers have no idea where they are, how they got there or if they’ll ever find a way home. Because the teachers are too terrified to venture outside the school, the students take it upon themselves to venture out into the alien planet’s woods and see what’s out there. Tynion said his series features adventure and horror elements mixed with overarching themes about growing up and entering the adult world from a teenager’s point of view. Gagnon said that the initial pitch and the depth of Tynion’s story is what led BOOM! to give “The Woods” an ongoing series. And while Tynion said he knows where the story is going and where it ends, as he plays within the world he’s created, he’s come to a point where the story is talking to him and leading him in surprising new directions. He said a lot of this was thanks to his conversations with Dialynas. Tynion said he had a two-hour conversation with the artist that completely changed how the series would approach the wildlife on the planet. “Michael [Dialynas] asks me all the right questions,” said Tynion. Jenkins said the freedom to explore where a story takes its creator without editorial interference or pressures from the film industry is what drew him to BOOM!. “Deathmatch” writer Paul Jenkins said he enjoys the creative freedom he has at BOOM! He said when BOOM! approached him to write “Deathmatch,” they pitched it to him as “The Hunger Games” for superheroes. Jenkins said he asked if he could make it something more than just characters killing each other off. He said both he and the publisher ended up using that series to test each other out. “We started doing it, and the fans love it, and I found myself in a great place creatively,” said Jenkins. He said the last time he felt this way was when he was working for Marvel Knights during the period when Marvel Comics filed for bankruptcy in 1996. He said during that time the editors at Marvel gave him complete freedom with complete editorial respect, because they wanted to try something new with their characters. He said it became harder to tell the stories he wanted to tell because of the increased focus on things like character crossovers and embargoes. 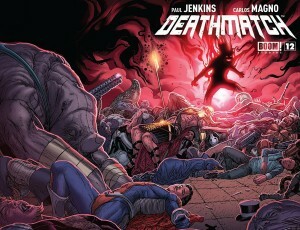 Jenkins said he realized while working on “Deathmatch” that BOOM! was a publisher that would let him tell the kinds of character-driven stories he enjoys creating. Gagnon said that the trust Jenkins is talking about comes from working with people who BOOM! editors connect with and believe in. 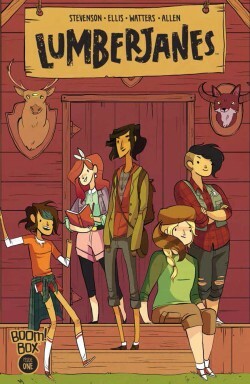 He said “Lumberjanes,” written by Grace Ellis and Noelle Stevenson with art by Brooke Allen, was a perfect example of these values. Gagnon said BOOM! approached “Lumberjanes” co-creator Noelle Stevenson after reading her webcomic. Gagnon said that the editors at BOOM! saw that there were people working on webcomics, but no one had asked them if they wanted to work on printed comic books. He said readers of BOOM! comics could expect to see a lot more of that coming up.